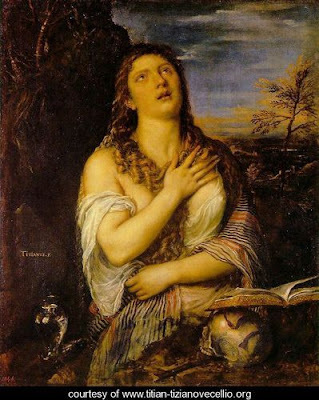 Today is the Feast of St Mary Magdalene, the “apostle to the apostles” because she announced to them the resurrection of the Lord. In the western Church, she is identified also with the penitent woman who washed the feet of Jesus, and sometimes with Mary of Bethany (sister of Martha and Lazarus. Certainly, Pope Gregory the Great in the sixth century declared them to be the same person. But the East has never made that identification. Today, there Western Christians tend to be divided on the question. Here are two hymns for today. The first (sung to the tune "Petersham") was written in 1884 by Mrs R.F. Williams, and clearly identifies Mary in the traditional Western way. The second is from the Saint Helena Breviary, published in 2006 and focuses on the Gospel for the day. It goes beautifully to the tune "Puer Nobis Narscitur." How sweet the rich perfume. To work for thee, thine own. Seek not the living with the dead. to tell God’s resurrection plan. and goes before to Galilee.